My friends are merely effigies I keep to remind me of the animal inside my mind. During the first decade of the second millennium, a group of seven friends—Zach, Lukas, Adam, Matthew, Peter, Arnold, and Taylor—occupy an indeterminate house in an unidentified American suburb and replay a continuous loop of eternal exile and youth. Permanently in their late teens, the seven young men are as fluid and mutable ciphers, although endowed with highly reflexive, and wholly generic, internal lives. “Once you learn how to love, you will also learn how to mutilate it . . . I want to feel so free you can’t even imagine . . . Let’s get out there and eat some popsicles. There is work to be done.” Eventually, the group decides to remove themselves from the safe confines of the house and to embark upon a road trip to the end of the world with their friend, the Whore, and their pet parrot, Jesus H. Christ. The Suiciders is their legacy. Chronicling the last days of a religious cult in rural America, Jeppesen’s debut novel Victims was praised by the Village Voice for its “artfully fractured vision of memory and escape,” and by Punk Planet for its masterful balance of “the laconic speech of teenagers with philosophical density.” In The Suiciders, Jeppesen ventures beyond any notion of fixed identity. The result is a dazzling, perversely accurate portrait of American life in the new century, conveyed as a post-punk nouveau roman. 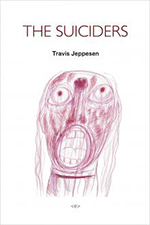 Travis Jeppesen is the author of two previous novels, Victims and Wolf at the Door. His writings on art and film regularly appear in Artforum, Art in America, and Whitehouse Magazine of Contemporary Art. He lives in Berlin and London, where he teaches at the Royal College of Art.